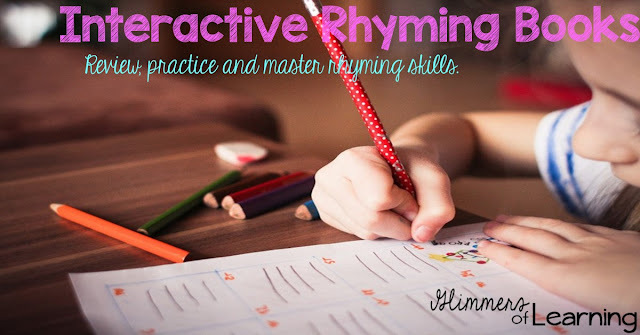 As a former early childhood special education teacher and now an inclusion specialist I see many students with speech and language delays as well as learning delays struggling to grasp the concept of rhyming. I created this packet that will be fun and interactive for students! You will receive two different interactive rhyming books. Students will be shown a picture and a word paired with the picture and the student will use the interactive pieces to show that they understand rhyming. For students with delays, especially speech and language it may be easier for you to say the words and ask the student if they rhyme. If students do not have great speech it will get in the way of their ability to hear the rhyme. For independent practice I have created two different mini books. Children are able to cut and color the pictures. Once they are done they can glue them on the correct page. These rhyming books would be great for morning work, literacy centers or for students who just need a little extra practice and they can be sent home with them. Check it out here, or click on any of the above pictures.